Miss my review last week? You can find it here. This week’s episode of the Venture Brothers brought the Blue Morpho plotline from last season to a satisfying conclusion. As with much of last season, the episode successfully provided a broader perspective by focusing on the story from Henchman 21’s perspective instead of the Monarch’s. Episode 2 follows the same timeline as last week’s episode, but with a focus on the Monarch, Dr. Girlfriend, and Henchman 21. When Henchman 21 accidentally sleeps in and wakes up to find the Monarch mobile missing, the Monarch’s lack of backup leads to him being quickly captured by the Wide Whale. From there, the episode switches back and forth between featuring the Monarch being beaten by the Wide Whale for murdering the Wide Whale’s brother, Dr. Dugong, in season 3 and Henchman 21 attempting to enlist the aid of Dr. Grilfriend and the Red death to rescue him. The team eventually rescues the Monarch not by force, but by using a revitalized Dr. Dugong to guilt the Wide Whale into letting the Monarch go. The episode ends with the arrival of the Blue Morpho mobile and someone dressed as the Blue Morpho racing into the Venture Building, thereby letting the Monarch off the hook. An undeserved win is still a win! Episode 2 made good on the expectations laid out by the cliffhanger of Episode 1. We get the full story of how the Monarch was captured and a satisfying resolution to his Blue Morpho arc. The icing on the cake was the Wide Whale having seen through both the Monarch’s disguise as the Blue Morpho and Hank’s disguise as Enrico Matasa. The Red Death was a true standout in this episode. 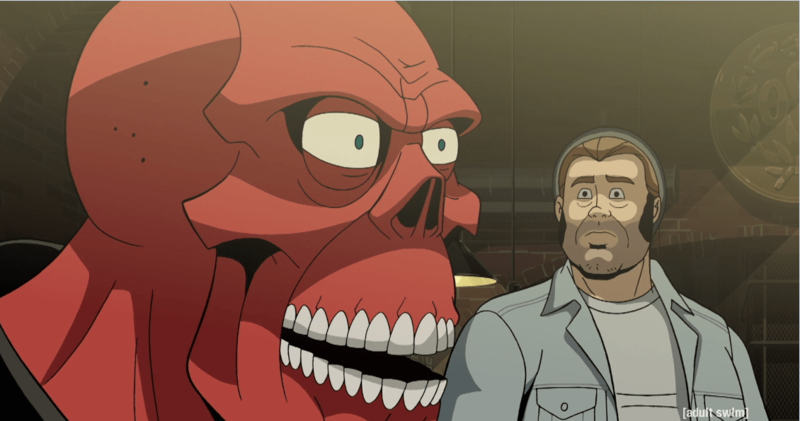 While he only appeared in one episode at the end of last season, the Red Death already has one of the strongest personalities of the members of the Guild of Calamitous Intent. This episode featured some wonderful moments with the Red Death, having him shift from adorable to terrifying at least once per scene. His discussion of his lucky kill socks was as adorable as his story of Movie Night on Gargantua 1 was dark. While the episode seems to have definitively finished the Wide Whale and Blue Morpho sagas, it did leave some room for anticipation. The arrival of the actual Blue Morpho coupled with last week’s reveal of Dr. Jonas Venture leave plenty of room for growth this season. It will be interesting to see if the fathers of the two most pivotal characters in the show will stick around to have a major impact on this season going forward.